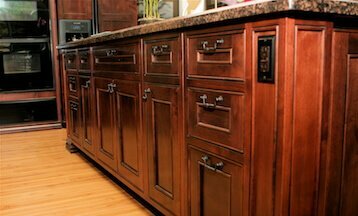 Standard Face Frame Cabinets are characterized by a frame on the face of the cabinet that is visible in the space between the doors and drawers. The cabinet door is then mounted on the face of the cabinet. 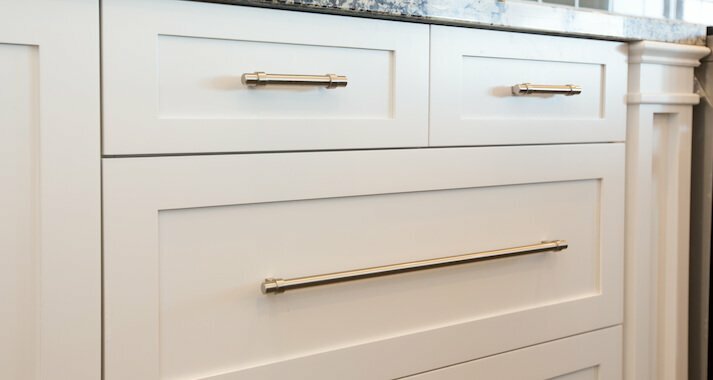 This creates a classic look that, when combined with any of the numerous finishing options available, can be highly customized to fit your specific design. 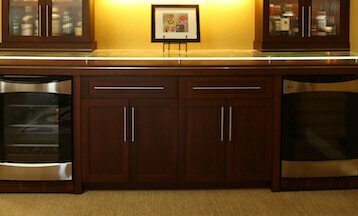 Face frame cabinets fit within nearly any style from traditional to modern. 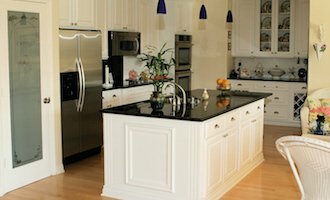 The look of Face Frame Cabinets can be customized in a number of ways such as the style of the cabinet door, the portion frame that remains visible between the doors (the “reveal”), and the hardware where concealed or exposed hinges can be used to create the look that you are most attracted to. Nearly endless combinations of these elements allow for nearly any look to be achieved. 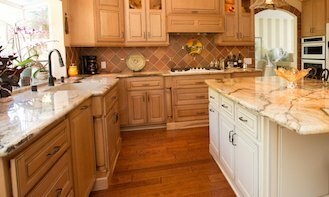 Frameless or European Cabinets as they’re sometimes called, do not have the front-facing frame that standard face frame cabinets have. This is the primary difference between the two styles. 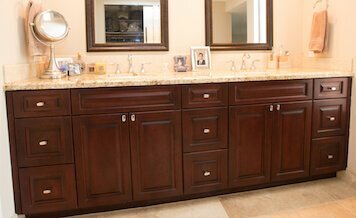 On a frameless cabinet, cabinet doors and drawers are mounted adjacent to each other with minimal spacing in between, creating a seamless look throughout the entire space. Door hinges are hidden entirely. The only hardware to be seen are the cabinet pulls or knobs. 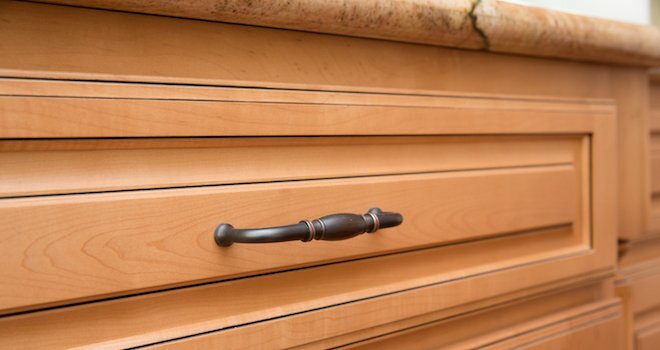 This style is typically seen in more modern design; however, the wide range of door designs, molding styles, and finish options make frameless cabinets suitable for any design. Call or contact us for a free consultation on which style works best for you. 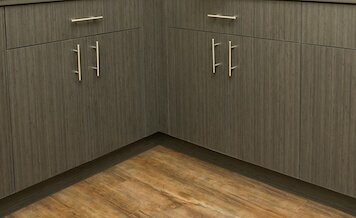 Inset Face Frame Cabinets are becoming more popular today. 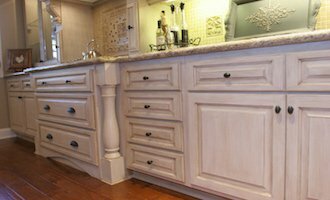 Originally seen during the Victorian periods, the doors and drawers of the cabinet fit within the front frame of the cabinet, creating nostalgic look that many designers and homeowners are seeking. 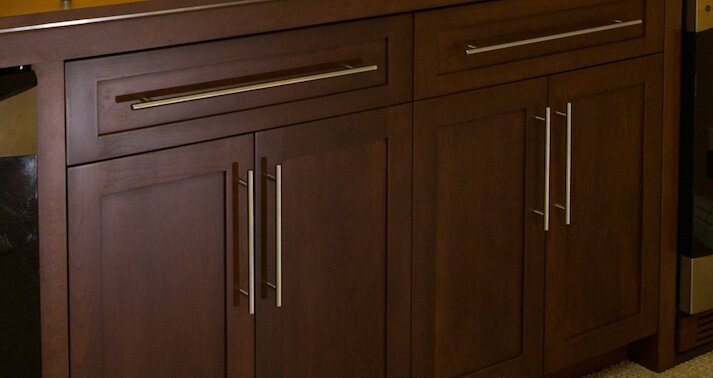 This fully exposes the front frame of the cabinet, allowing the full beauty of the cabinetry to show through. 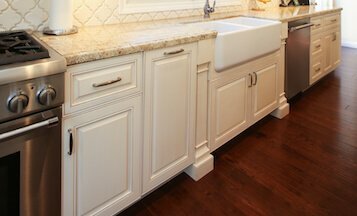 Inset face frame cabinets feature clean lines with flush doors and drawers. Concealed or exposed hinges can be used to create the look you are most attracted to. The look can be further refined by adding moldings within the inside of the face frame opening for an added touch of detail. Depending on the finish, hardware and door style, the final look can range from antique to modern.